Trance encounter: Can it really be 25 years since acid house was born? What became of the ravers? Once they were dancing in the warehouses and fields, now they’re the mums and dads, the entrepreneurial company directors, the van drivers, the Radio 2 listeners, the politicians and that middle-aged lady in the park, walking her dog. It is 25 years this summer that a series of cultural forces collided to shift the tectonic plates of British music. The first tremors came from the Balearics and the projects of Chicago, compounded by the emergence of a euphoric drug known as ‘E’. The aftershocks are still being felt today. In the United States, the Electronic Dance Music (EDM) movement is only now coursing through mainstream youth culture as it did in Britain a generation ago. And in fashionable east London clubs such as Dalston Superstore and Bar A Bar, a new crowd of ravers are enjoying a summer of love with nights like Paris’ Acid Ball. “I’ve always thought this was an evolving scene – and it’s still evolving,” says Dave Swindells, who chronicled British club culture in words and photographs as the Nightlife Editor of Time Out between 1986 and 2008. With Mason and the graphic designer Dave Little – the artist behind such Acid House institutions as the club Spectrum and the Boy’s Own fanzine – Swindells is staging ‘A Little Summer of Love’ celebration in west London this evening to recognise the emergence of a movement that changed their lives. Mason has devoted several years to creating a lasting document of the acid house story by filming interviews with no less than 75 of the original protagonists – the promoters and DJs, the musicians and the security guards, the dancefloor stalwarts and even the police officers who trailed them from the city to the motorway service stations and on into the countryside as the parties grew larger and moved outdoors. This exhaustive account has cost him around £100,000 and taken him around the world. For the sources of acid house are diverse. Without question a pivotal moment was the decision in 1987 by the young DJ Paul Oakenfold to spend his 24th birthday on the island of Ibiza where his friends, Trevor Fung and Ian St Paul, had rented a bar. He took fellow soul boys Danny Rampling, Nicky Holloway and Johnny Walker with him. What they experienced in the club Amnesia that holiday – an ecstasy-enhanced exploration of the sounds of resident DJ Alfredo – was to change the course of global club culture. Other forces were at play as the British music scene began an extraordinary transformation. Earlier in 1987, a group of Chicago proponents of the electronic-based sound called ‘house’ toured the United Kingdom for the first time. They attracted little attention in London, but Marshall Jefferson, Frankie Knuckles and Adonis were treated like heroes in cities such as Manchester and Nottingham, where the repetitive beats of house were readily accepted by an audience raised on Northern Soul. In the months to come, pioneering northern DJs such as Mike Pickering and Graeme Park would become house evangelists. 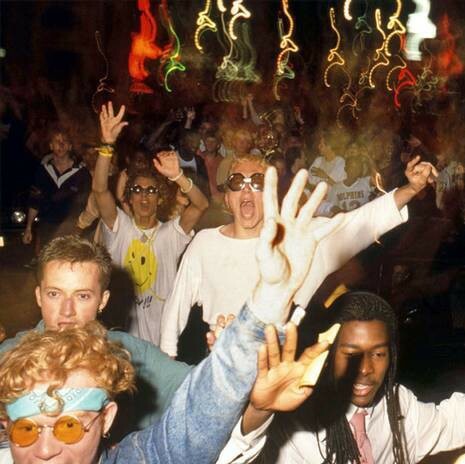 Both fledgling scenes were inspired by the club scene of New York and particularly Paradise Garage, where Oakenfold and Pickering were among British visitors hypnotised by the cavernous dark room and the music played by the likes of Larry Levan. The Garage became an inspiration for Manchester’s Hacienda and, several years later, London’s Ministry of Sound. But the first club in the capital to reflect the new scene was The Project, Oakenfold and St Paul’s attempt to gather together the English bar workers who had spent the summer in Ibiza and to recreate the Balearic atmosphere they’d discovered. This fledgling acid house scene took its name from the Chicago tune “Acid Tracks” by Phuture. Other clubs emerged: Hedonism – on a west London industrial estate – was the first acid all-nighter. RIP was a sweat-box above a 12th-century prison alongside the Thames. As word spread, the Project grew into the f larger Future club while Shoom, in a south London fitness centre, quickly became an institution. The ‘Smiley’ logo T-shirts and dungarees that were an unofficial uniform for many Ibiza bar workers in the summer of 1987 were adopted by some ravers in London, but would become an embarrassing cliché. As acid went overground, The Sun picked up on the scene and ran a story, ‘Fiver for a drug trip to Heaven in Branson club’, which drove Spectrum out of its home and, ironically, provided the mass publicity which helped create the rave nation.